Vopak has announced that Mr. M. van der Vorm has decided to step down as member of the Supervisory Board of Vopak as per 18th December 2014, following his decision to step down from the Executive Board of HAL Holding NV (as announced by HAL Holding NV on 6 August 2014). The Supervisory Board and the Executive Board thank Mr. Van der Vorm for the important role he has played for Vopak during his tenure. An Extraordinary Shareholders Meeting will be held on 18 December 2014 in which it will be proposed to appoint Mr. M.F. Groot as member of Vopak’s Supervisory Board as per that date. Mr. Groot has been with HAL Holding NV for the past 25 years, since 1 October 2014 as Chairman of the Executive Board. The formal notice of the Extraordinary Shareholders Meeting, the Agenda and the Shareholders Circular are available on the Vopak website. 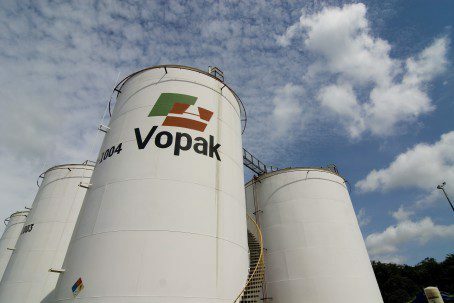 Royal Vopak is the world’s largest independent liquid bulk tank storage service provider by capacity, specialized in the storage and handling of oil products, liquid chemicals and gasses. As per 29 October 2014, the company operates 80 terminals in 28 countries with a combined storage capacity of more than 33 million cbm, with another 4.9 million cbm under development, to be added by 2017. Vopak’s mission is to ensure safe, reliable and effective storage and handling of bulk liquid products at key marine locations that are critical to its customers around the world. The majority of its customers are companies operating in the oil, chemicals and gas sector, for which Vopak stores a large variety of products destined for a wide range of industries.